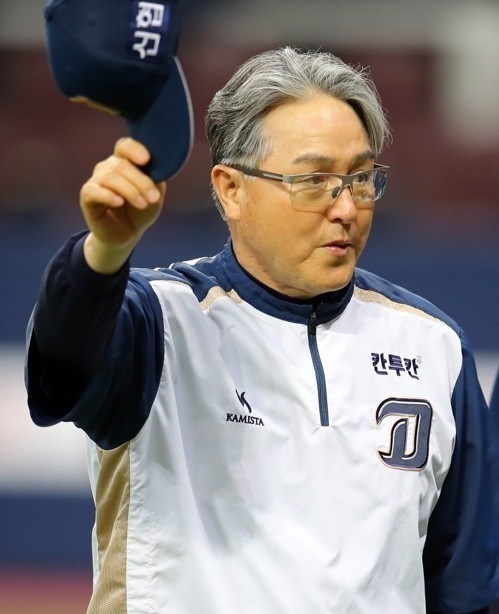 South Korean baseball club NC Dinos said Tuesday their manager Kim Kyung-moon will be sidelined indefinitely with a benign brain tumor. The Korea Baseball Organization club said Kim has been diagnosed with a small benign tumor in his pituitary gland. The Dinos said while an operation won't be necessary, Kim has been advised to take a few more days of rest. Kim left last Friday's game against the KT Wiz in Suwon, some 45 kilometers south of Seoul, with dizziness and symptoms of acute indigestion. He was admitted to a hospital in Bundang, near Suwon, and the Dinos said Kim's conditions have improved a great deal over the weekend.